I’m so enjoying the swiping right now. I still have a lot to learn and a lot I want to try, but while I’m having some success I’m going to stick with it and try out some different colors. The last blue painting came out a little dark so I’m lightening up the colors a little, bringing in a different blue to add to the silver, and adding a little white to the dark blue/green mix I used before. This time I’m going to take better care of the canvas so that it doesn’t tip and lose the shape while it dries. It’s my best so far I think. Here’s the video and scroll down underneath to see some pretty shots of the painting and the details. Thanks for watching. Scroll through the slide show below to see more photos and more details of this painting. And don’t forget to pin this article and video for later – there’s a handy Pinterest sized image at the bottom of this article and a Pinterest sharing button right underneath. Hi! Want to know if you have used silicon in the white acrylic, too. I just love this technique but not sure how it works. Yes I did use the silicone in all of the paints including the white. I’ve heard that you can get different results if you add or decide not to add to your swiping color but I don’t have enough examples done yet to see if this is true. Give it a try – all paints are different! What type of silicon do you use? I have tried 3 different kinds and none seem to have this effect. What is the name of a torch you have used in the last? I also wanna try this! It’s amazing. Any of the torches that you see here (http://amzn.to/2rQDY4I) would work for this method. If you do try it out, I hope you will come and share in our Facebook group. Can you please tell me about the torching? What kind of torch do you use? Where do you buy one? Thank you. 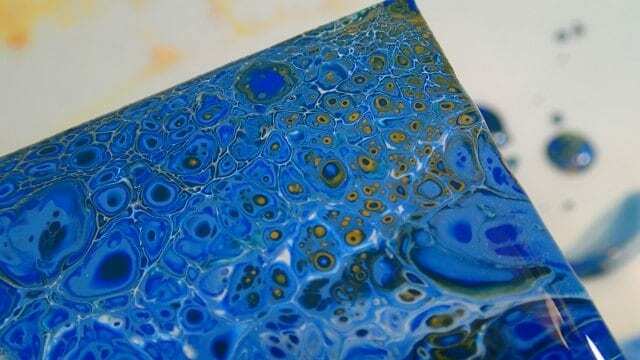 The torching pops the air bubbles in the paint and can also encourage the cells to appear too. I absolutely love your paintings. Please can you tell me where I can purchase the right silicone spray in the U.K. Absolutely loved your attempt with with the blues.Stunning. I love the results in your painting,truly beautiful.I was wondering if you could use a blow dryer .Would that work? It might get hot enough but usually it would blow the paint around more than you would like if you are using it to try to get cells. You can use it to spread the paint as part of the design for some interesting effects. Ive seen videos that use a heat gun, the kind to shrink wrap stuff. I want to start doing this. 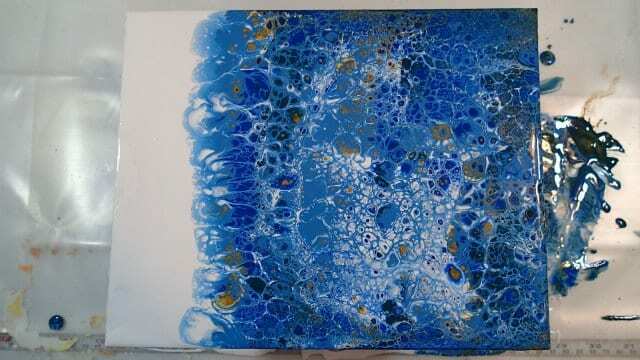 So you use paint with water, silicone and do you add something else also? Yes you would ideally need some kind of a pouring medium to thin the paint other than just adding lots of water to it. Most of my videos will show the products and recipe that I’ve used. 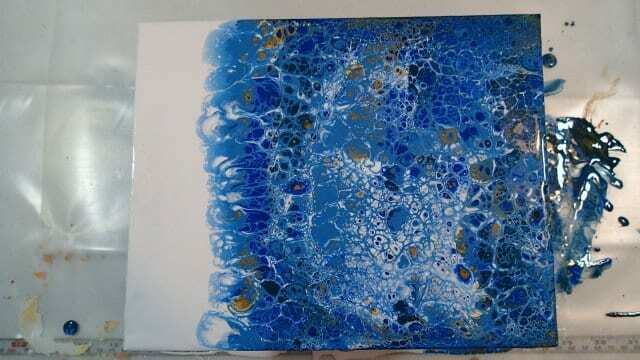 I like 2:1 paint to floetrol + water + oil. Hope that helps. I really want to try this! How hard do you press when you swipe? I’m afraid I’d take off too much or too little. Also, about how long do they take to dry? I don’t press at all. More like lightly pick up the swipe color on the card and glide it gently over the top of the other colors. If you are dragging the paints about, then its probably too hard. 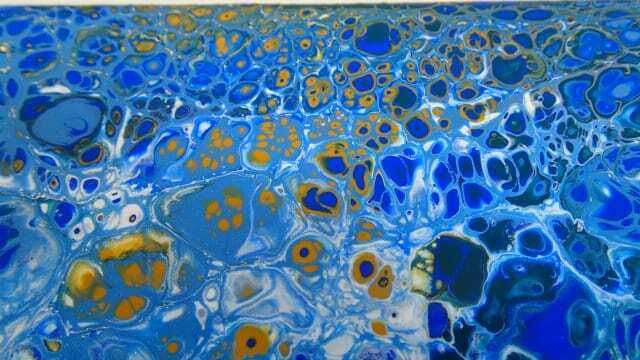 My paintings take about 3 days to dry though to the center but it depends a lot on your environment. Its very humid here so it takes longer. 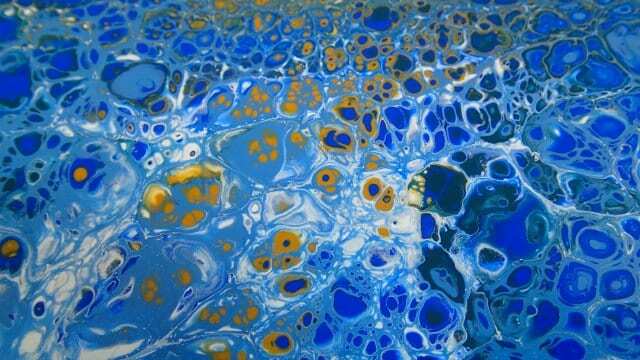 You’re awesome with paints I love all & specialy blues ,thanks for sharing your gr8 talent! ?? How can I find you on YouTube so I can follow your work and search for videos with step by step instructions and a full list of materials? 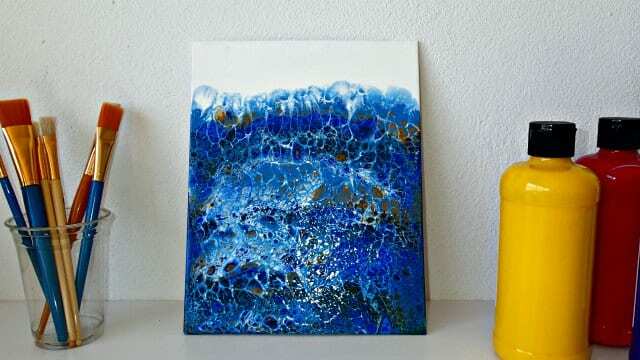 I’m a beginner acrylic painter and I’m fascinated by this amazing technique. The best place to follow is here on the blog because I am able to give a lot more info such as all the materials used, recipe, instructions, links, photos etc. along with the video. If you sign up to the newsletter you get a weekly update of all the new videos and articles. The written articles aren’t on YouTube so you could be missing out if you only follow there. Check out the FAQ page here for helpful articles too.